Update April 2, 2015: The event was a great success! We agree Megan. Congratulations on a successful event. Members, please watch the News for information on great events like this. This is a fund raising event open to all Johnson Controls employees and retirees. Here’s an opportunity to do some good while having some fun. Big Brothers Big Sisters certainly does some fantastic work in our community. Megan Strock, our good friend at Building Efficiency Human Resources, wanted to make sure that we knew retirees are invited and encouraged to participate in this event. Those ‘teams of 4’ could include you with friends, retired or working. If you’ve been looking for an excuse to get back together some of your colleagues, this might just be it. Give them a call. 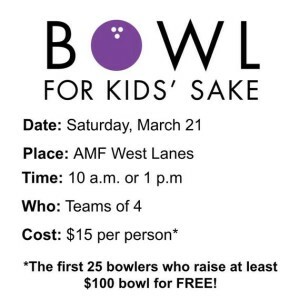 Here’s a link for more information: Bowl for Kid’s Sake. And, here’s where you can register: Registration Form. Note that team registrations are due by March 6, 2015. The location is AMF West Lanes, 7505 W Oklahoma, Milwaukee. It looks like a great place to have some fun. Check it out and have some fun! HEY! I just noticed that not only are employees and retirees of Johnson Controls invited to participate, the registration form includes contractors to Johnson Controls in the invitation. Now, retirees are know to have some pretty good networks that include those contractors — any ideas how to include them in the fun?